We are just 23 days away from the primary election here in Washington State. We are working around the clock to get out the vote, and we have incredible volunteers stepping up in communities all around the state. 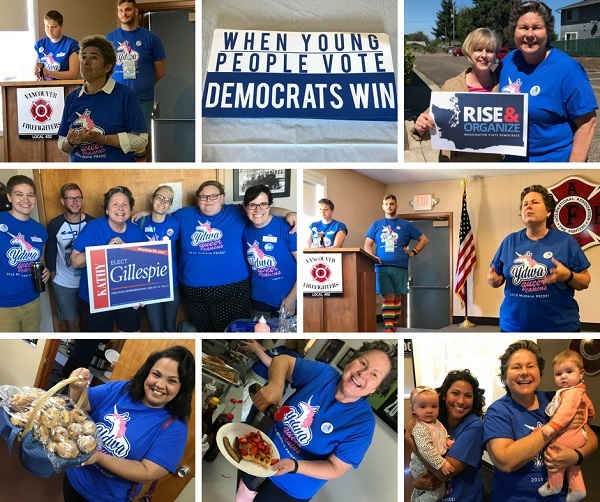 Chair Tina Podlodowski was in Southwest Washington this weekend, where the energy to elect Democrats is real, and it is palpable. Tina joined the Young Democrats of Clark County for their annual Waffle Breakfast. She also met up with some of the fantastic Democratic candidates and elected officials in LDs 17, 18, and 49. It is so important that we turn out voters this year to elect Democrats up and down the ballot. We’re on the ground all over the state working with grassroots leaders and volunteers. We’re listening to voters. We’re connecting with them over shared values. We’re mobilizing enormous numbers of voters. And it’s working. But we have to make sure we have the resources to reach as many people as possible. Will you make a contribution today? Just a few dollars can make a huge difference in securing the resources, material, and staff we need to elect Democrats up and down the ballot in August and in November. On Monday, Donald Trump appointed Judge Brett Kavanaugh to replace the retiring Justice Anthony Kennedy on the U.S. Supreme Court. Kavanaugh is a threat to women’s rights and to Americans’ health care. If the Senate votes to confirm Kavanaugh, he will be an extremist and will use his position on the bench to roll back reproductive rights and undermine access to affordable, quality health care. When the U.S. Court of Appeals for the D.C. Circuit upheld the Affordable Care Act, Kavanaugh wrote a dissenting opinion, suggesting that a future president could refuse to uphold the ACA. That’s exactly what Donald Trump is doing now. Kavanaugh also opposes requiring that employers use employee health insurance plans that will cover birth control. Kavanaugh has opposed net neutrality and called the Consumer Financial Protection Bureau unconstitutional. Perhaps more alarming, Kavanaugh’s views on presidential power show that he would not be an impartial check on President Trump. Kavanaugh believes that the president is above the law. Even if every Democrat opposes Kavanaugh, he will still be confirmed in a partisan vote. In order to keep Kavanaugh from imposing his extremism on all Americans, we have to convince Republicans not to support him. Help us send a message to Republicans that if they support Kavanaugh, we will replace them. On Friday, Special Counsel Robert Mueller indicted 12 Russian intelligence officials for their roles in interfering in the 2016 presidential election. These are the latest indictments from the special counsel, who has now charged three Russian companies, 26 Russian nationals, one Dutch national, and five Americans so far in the course of the investigation. Mueller’s investigation is producing results. And it is gaining momentum. Yet Trump insists that it is a “witch hunt.” If Trump tries to fire Robert Mueller or Rod Rosenstein, he will be declaring himself above the law. Lisa Brown Fuels Campaign with People Power! Big news from Eastern Washington: Lisa Brown outraised Cathy McMorris Rodgers last quarter! The vast majority of Lisa’s fundraising came from individuals Lisa also had a much higher percentage of her funds come from inside the state than Cathy did. There is one category where Cathy raised more than Lisa -- money from PACs. Cathy is taking money from PACs, including hundreds of thousands of dollars from corporate PACs that want to buy her vote. In contrast, Lisa is taking no money from corporate PACs. And she’s still outperforming Cathy. Want to show your neighbors how you feel about the ultra-conservative three-time statewide loser running as a Republican in the 8th Congressional District? 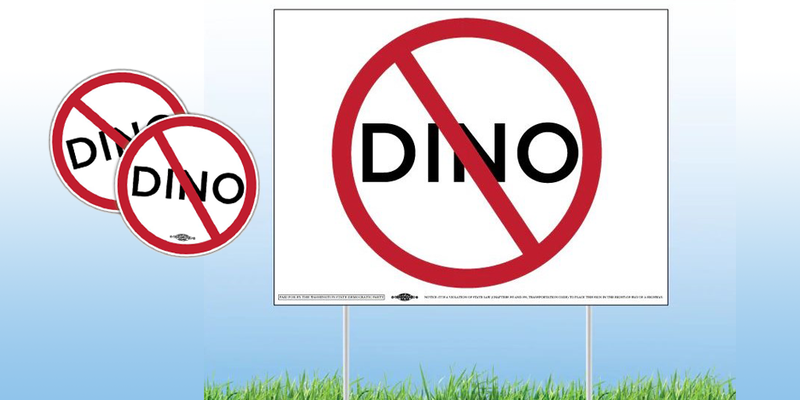 Then you could use one of these yard signs! 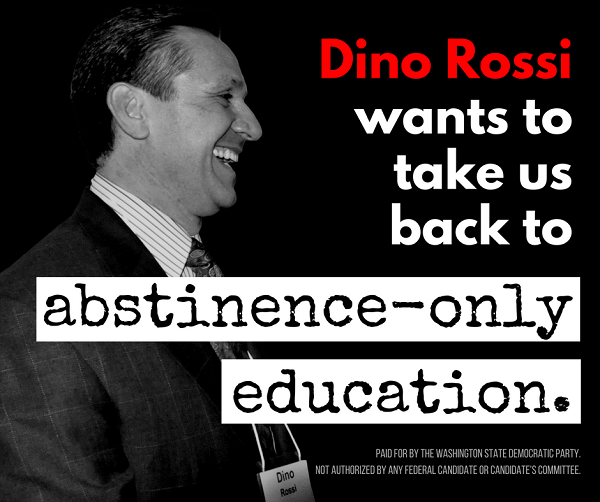 Check out our official online store to get your No Dino Rossi yard sign, sticker, or button today! And make sure to check out the other merchandise we have available! After a difficult few weeks, there are reasons to be hopeful. Our field program is accelerating and will be firing on all cylinders into the primary. The energy around the state is amazing. 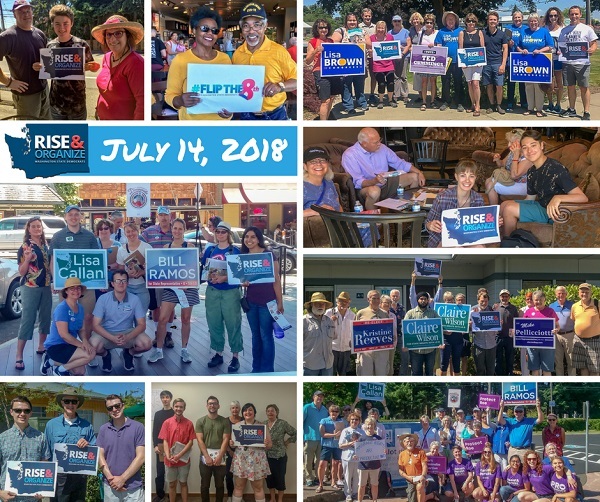 Organizers and volunteers are working hard to elect Democratic candidates who will champion progressive values and fight to restore stability and common sense. But there is a lot more work to do in the coming months. 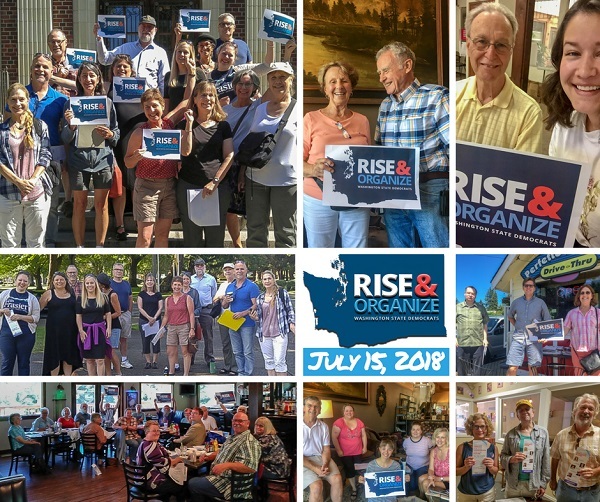 Join us by starting a monthly, low-dollar contribution to our organizing efforts now, so we can replace Republicans -- who are just along for the ride -- with Democrats who will put the future of our country and our communities first. 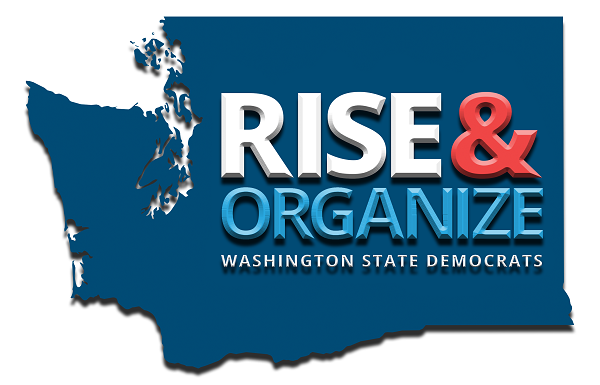 If you’re not already part of our Rise & Organize program, you can join today and help us put steady hands back on the tiller.